Welcome! You've reached my personal homepage! I'm Sr. Lead Computer Scientist at at Space Ground Systems Solutions, Inc. We're a dynamic group supporting systems development at the Naval Research Laboratory (NRL). 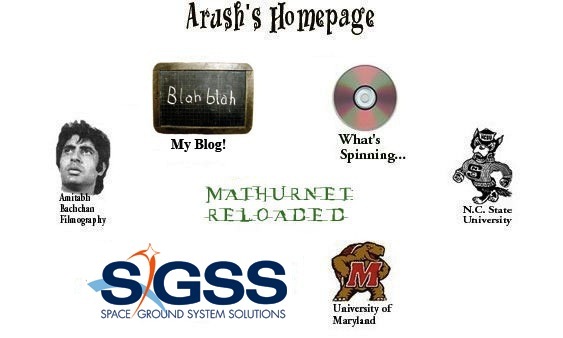 I am an alumnus of University of Maryland (B.S., Computer Science, 1996) and North Carolina State University (M.C.S, Computer Science, 1999). When I'm not sitting in front of a computer, I can be found out on the town with my wife & family, hanging out with friends, playing basketball, practicing bass, watching sports, reading, or (my favorite activity) listening to music! You can check out my rants/raves on my favorites subjects here. While this page is stuck in turn of the century design (mainly because I am too busy to work on it), it did receive a mention in India Today many years ago. Send website comments to postmaster@kumar.com with subject heading "Website Comment". Emails without this subject heading will likely be trashed as spam. This domain is NOT for sale. Copyright © 1997-2016 by Arush Kumar, all rights reserved.